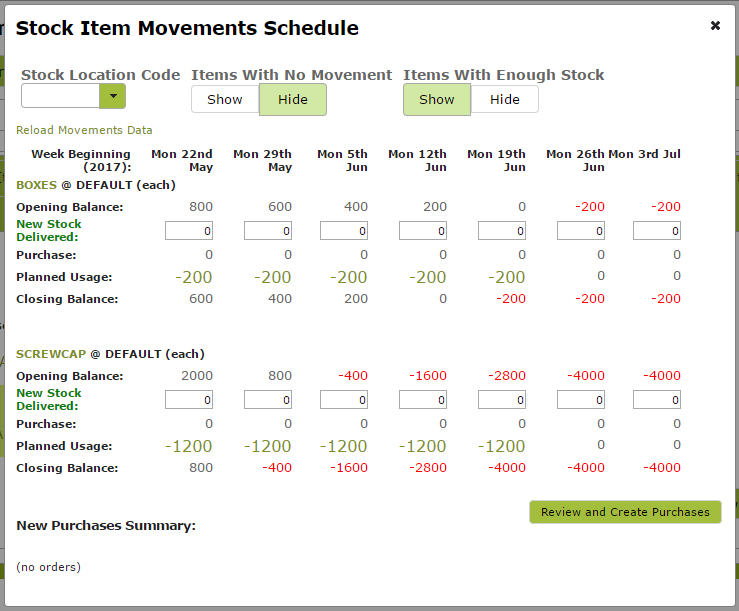 The Stock Item Movements Schedule view can be used to facilitate your Material Resources Planning (MRP). It shows you a week by week overview of Stock Movements that have been planned in advance using Vinsight. You are able to easily see where Stock levels will fall short of requirements, and you can generate Purchase Orders directly in the view to make sure new stock arrives on time. There are currently two areas in which you can open up the Stock Item Movements Schedule: the Stock Items List, and the Packaging Operations List. If you are on the Stock Items list, you can select one or more Stock Items and click on the bulk action “review purchase schedule”. You will get a report based on the Stock Items you have selected. If you are on the Packaging Operations list, you can select one or more Packaging Operations and click on the bulk action “review purchase schedule”. You will get a report based on any Additions that are scheduled for use on any of Packaging Operations you have selected. Each Stock Item you are reviewing will have a section per Stock Location. 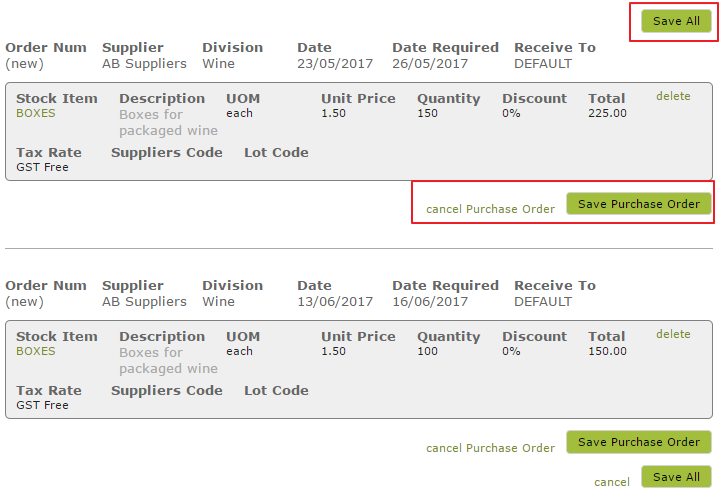 In this example, we are reviewing stock levels at the “DEFAULT” location for two Stock Items, BOXES and SCREWCAP. Each column represents all movements occurring within a given week. Opening and Closing balances let you see how much stock you start and finish with each week. If a balance is negative, it will be shown in red. The options at the top of the Schedule can be used to show and hide different types of movement. Stock Location Code – Putting a location in this box will cause the Schedule to only show movements for a single location, rather than for all locations. Items With No Movement – Hidden by default. If you show these movements, you will be able to see all Stock Item, even if there are no planned movements for them. Items With Enough Stock – Shown by default. If you hide these movements, you will only be shown places where the stock is going to run out of stock in the upcoming weeks. Reloading the report after saving the Purchase Orders will show you the updated Movements Schedule. In this example, two Purchase Orders have been added and now we will not run out of BOXES to use for the weekly Packaging Operations.